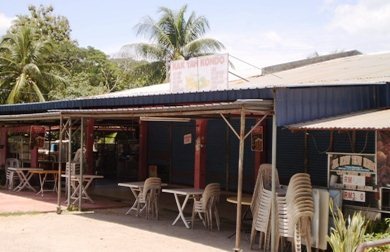 This is essentially a street side restaurant located in Kuah on a back road. So it's not easily visible to the non-residents or tourists. But those who know and the locals around will certainly vouch for the food here. Yes you come here simply for good local food and also to chat with your friends over long hours in the late evenings. This is one restaurant in Kuah which remains open until very late and you can even walk in at 1am and still get fresh food. In the evenings when the inside seating gets full, they put tables on the footpath (by the road side). You seat on plastic chairs and dine on make shift tables (which can be easily moved around). The overall ambience is very casual, relaxed and friendly. The restaurant is popular for the variety of Malay food they serve and at a very reasonable price. Other great dishes include seafood preparations, Koew Teow Kerang, Char Koew Teow, Laksa, Sotong Kangong (nasi bungkus seringgit which comes in different other flavors), Jagung etc. We have tried out several of these dishes, they are not only good but always served fresh. They serve dinner (from early evening hours until late). Open from 4pm until 2am. Closed on Thursdays. It's located right opposite Kondo Istana.